The shredded remains of of one of the estimated seven trillion dwarf galaxies in the observable Universe has been located buried within our Milky Way Galaxy. Some astronomers think that the largest globular cluster in the Milky Way, Omega Centauri, might have once been a dwarf galaxy that had its outer stars stripped away. The massive swarm of stars is known as the Aquarius Stream. Astronomer Mary Williams, who is working with an international team in Germany on a million-star survey, found the "Aquarius Stream." "It was right on our doorstep, but we just couldn't see it." In 2011, Williams led a team of astronomers using a telescope in Australia, operated by the Australian Astronomical Observatory, to find the galaxy, which had been "gobbled up" by our own, said the observatory's professor, Fred Watson. 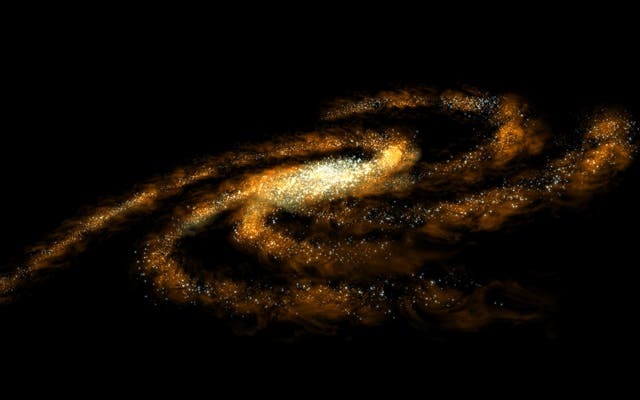 Although models predicted that big galaxies such as the Milky Way were surrounded by dwarf galaxies, Prof Watson said astronomers rarely saw them. "Perhaps many of them have been eaten up by the big galaxies. So, we're looking at our Milky Way Galaxy to try to find little galaxies that it's swallowed." Dr Williams said the project team was analyzing the movements of 12,000 stars in the Milky Way when she noticed 15 stars moving strangely, at speeds of up to 15,000kmh that turned out to be part of a large stream of stars originating from a small galaxy that the Milky Way had "dismembered" about 700 million years ago, she said. As most of the stars in the stream lay in the direction of the constellation of Aquarius, the group had been called the Aquarius Stream. Prof Watson, who heads the international survey project, said the stream was, at its nearest point, about 2000 light years away from Earth, but about 30,000 light years away at its farthest point. The Aquarius Stream covers an area of the sky about 1300 times the size of the full moon. "To just look at them you wouldn't know they're any different from the stars in the sun's neighbourhood –- it's when you look at how they're moving all together in this stream that reveals that you're seeing a fossil." About 15 other star streams had been found in our galaxy, but most arced up out of the galactic plane into much emptier space, and so had been easier to spot. Professor Joss Bland-Hawthorn, of Sydney University, said the project was part of the 10-nation Rave, or Radial Velocity Experiment programme, looking at the ancient origins of the galaxy. The Hidden Universe: "There are Billions of Undetected Galaxies"